Smartphone has been integrated with more and more functions but if barcode scanner capability is one of them that have been missed out in your requirement, the recently announced tiny portable device may able to fill up the gap. Named as KoamTac, it is a Bluetooth enabled barcode scanner that can be paired with your smartphone regardless if they are preloaded with Windows Mobile, Apple’s iOS or even Android Operating Systems. 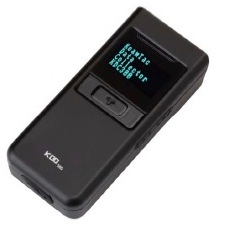 Available in two models namely KDC200 and KDC300 series with each of them weighing merely 1.2 and 1.9 ounces respectively, these tiny devices are quite convenient to be carried around. KDC200 is slightly smaller targeted for 1D barcode scanning while KDC300 is designed for both 1D and 2D scanning. Whenever there is a need to scan barcode, these data will be sent wirelessly to the smartphone nearby (in a radius of 30 feet), making the whole solution much more preferable as compared to conventional method. Just imagine, now users don’t even need to carry smartphone by leaving it on table top, while the tiny Bluetooth barcode scanner can be worn around their necks for fast and accurate scanning in production or warehouse environment. No pricing information yet, both the devices are already available now and in order to utilize it, users need to get KTSync apps which is already available across different platforms such as Apple’s iPhone, iPod Touch, iPad, windows Mobile, RIM BlackBerry as well as Android (in the plan to be released by next month).